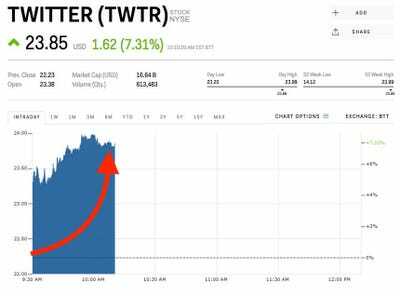 Twitter shares are up after JPMorgan upgraded the company and called it a top idea for 2018. New product improvements could bring a lot of new users and advertisers to the platform. The company also said it will start acting on its previously announced rules banning hate speech on Monday. Shares of Twitter are up 7.31% to $US24.01 after an upgrade from JPMorgan and saying it will begin enforcing its rules aimed at reducing hateful and abusive speech. On Monday, JPMorgan upgraded Twitter to overweight, calling it one of the bank’s best ideas for 2018. 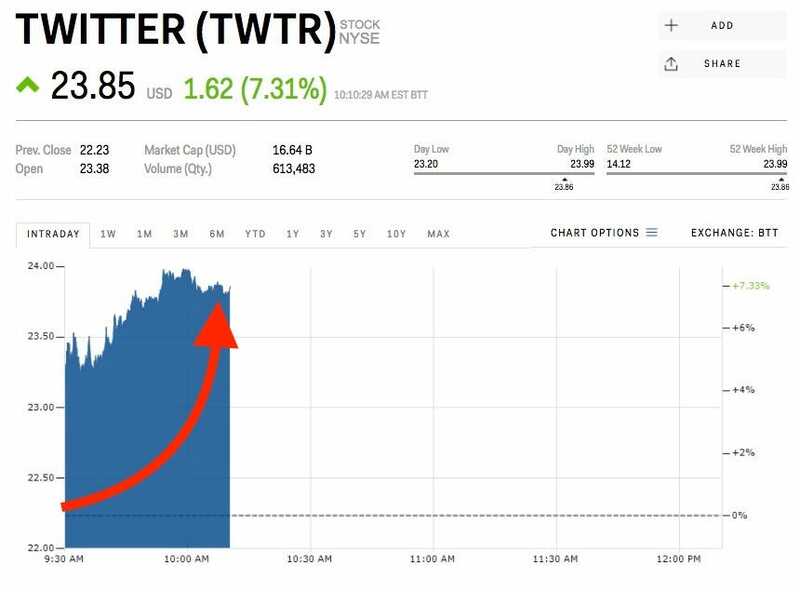 “We believe both the Twitter story and financial results will strengthen over the next year as the company continues to build on its differentiated value proposition for users and returns to revenue growth,” Doug Anmuth, an analyst at JPMorgan, said in a note to clients. Anmuth said that the negative drumbeat around Twitter could start to change in the coming new year. The company is improving its product, growing users and ad revenue, and should become GAAP profitable in 2018, according to Anmuth. Twitter has started to make good on its promise to clean up its platform. On Monday, the company said it will begin taking action against users that promote or glorify violence on or off the platform. Offending tweets will be removed, and multiple violations will result in a permanent ban, according to Twitter. Twitter has faced harsh criticism in the past from its users from not taking action against hateful accounts. After releasing new features that haven’t combated hate speech, users often criticise the company for not working to “ban nazis.” The new rule enforcement includes a loophole for members of the military or government, which means US President Trump would not be subject to the rules. Twitter has also implemented a new way of tweeting threaded tweets and a longer character count recently. Anmuth says these, and other product announcements will help accelerate user and advertising growth on the platform. JPMorgan has a $US27 price target on Twitter, which is about 12.5% higher than the company’s current price. Anmuth’s earnings estimate for 2018 is about 15% higher than Wall Street’s consensus. Twitter is up 45.13% after Monday’s move. Click here to read about the top research analysts on Wall Street.